Yes, I know I’m quite late in new year’s greetings. 2012 being the year of the dragon I decided that the first post should be all about dragons. So I started folding a chinese modular dragon that I was eyeing for quite some time; I started the dragon and mid January arrived in a dash. I then though, I’ll make it in time for the Chinese New Year. One day, I picked up my dragon and it was already the 13th of February. 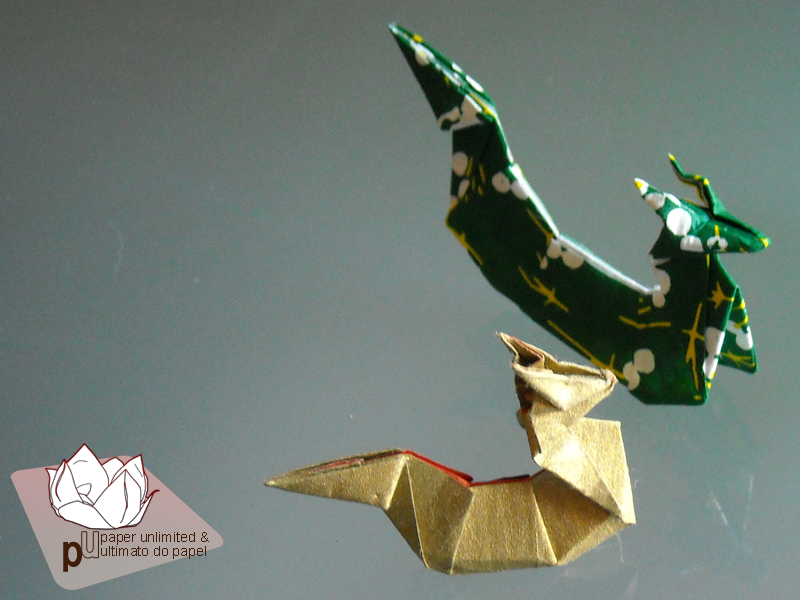 I decided to fold another dragon, a simple and cute one so I can finally wish people a Happy New Year. That’s the not so short story of this post. A google search later I knew the proportions of a one dollar bill and cut some paper. Afterwards I remembered to make a dragon with an Euro Bill but since the proportions of the bills are different the dragon is shorter. But still cute. 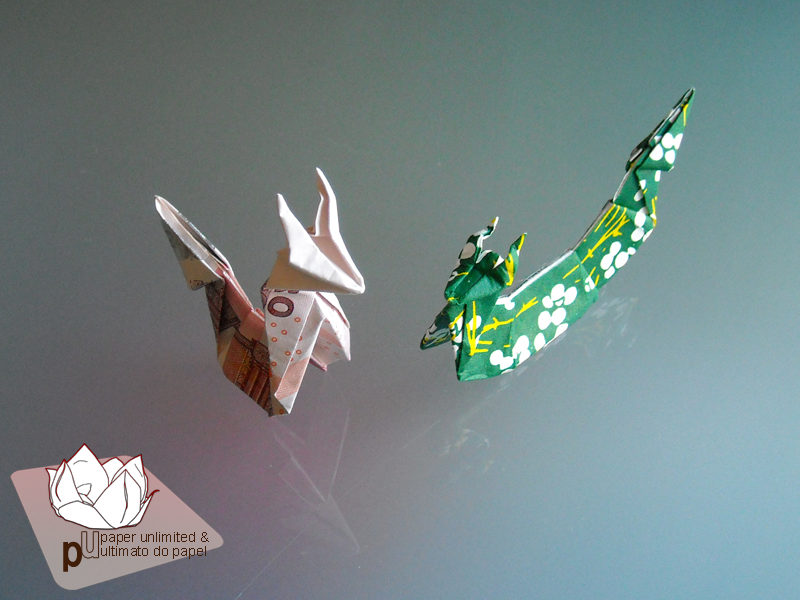 And money paper is a good medium for origami. I might have found a good way to save some money. Really, I didn’t unfold the bill! Nor I plan to unfold it soon. Golden Dragon: Kraft paper, 1:2 ratio. 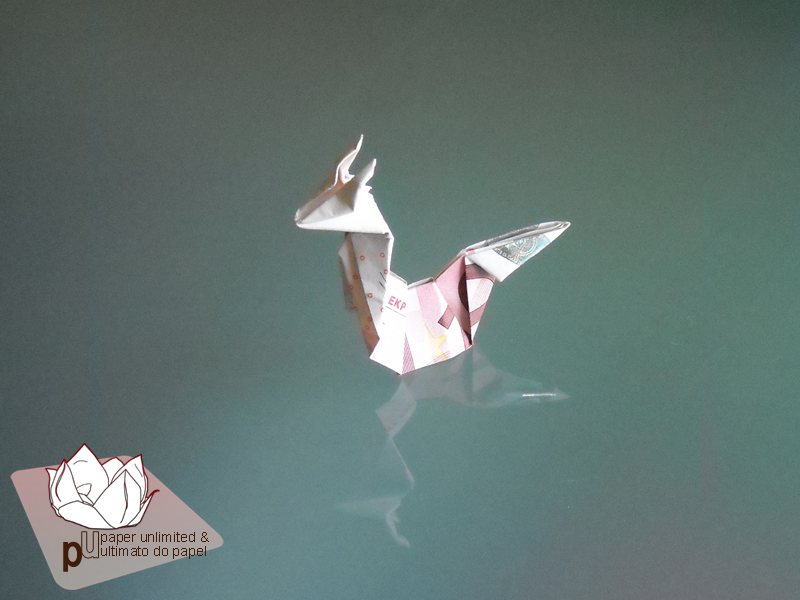 It was the paper I had in hand when I folded the first dragon! 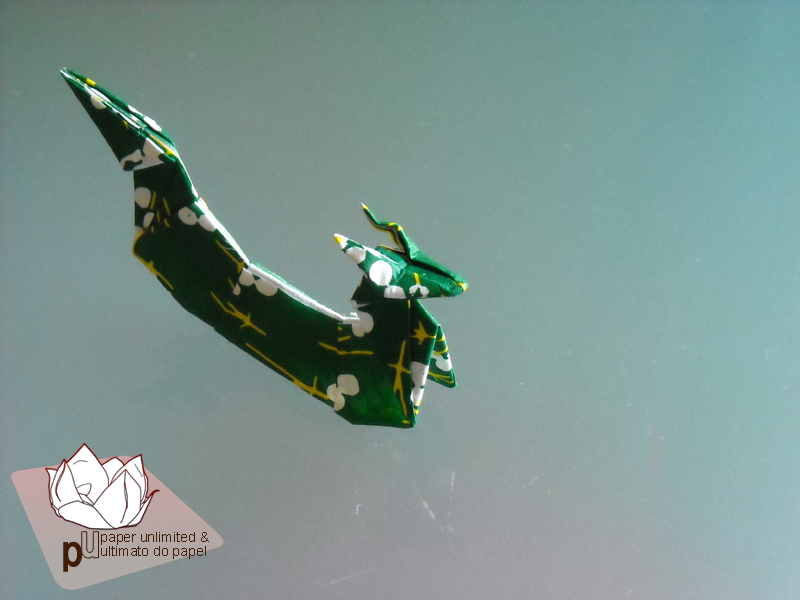 Green (flowery) Dragon: washi paper, 1 dollar bill paper ratio. Made in washi with traditional motives printed in the paper. This is also a water dragon but it likes greenery and flowers more! Money Dragon: this is a fire dragon! A dragon in it’s native element! This is a baby dragon. Hopefully it will grow from a nice €10 bill into a beautiful €500 bill. Please let me have hope. And delusions, too. A little note: western dragons are portrayed as the very symbol of evil in most cases but the Eastern/ Asian dragon is a symbol of luck, good will and power! It’s different in shape too: it resembles a snake with four eagle paws and in many oriental representations it holds a pearl. The dragon’s element is fire, they have that in common with the western counterpart, and this year the dragon rules water. Water being related to emotions this will be a complicated year. Dragon years are good to accomplish objectives. Actually, this is THE year to accomplish objectives. If not, until the next dragon year life can feel like standing still, and not in good way! 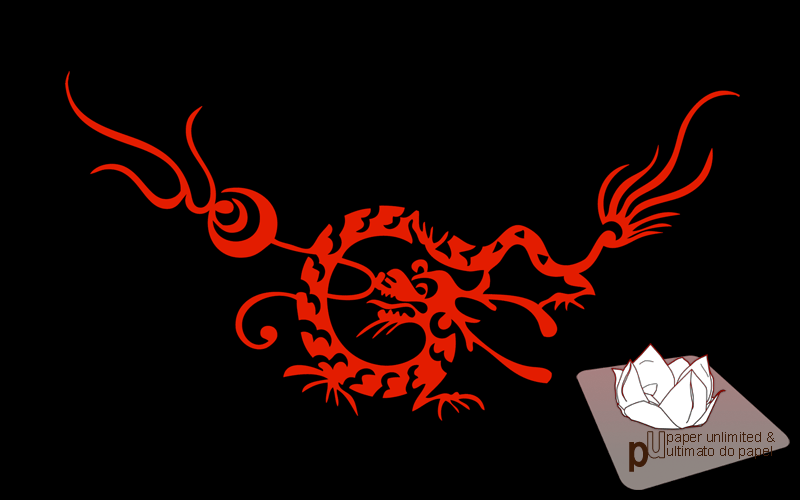 The image above shows a paper cut chinese dragon with a pearl. I’ll share more about dragons, western and eastern when I finnish my dragon. edit: I changed the title from “origami: asian dragon” to “myth: asian dragon”. 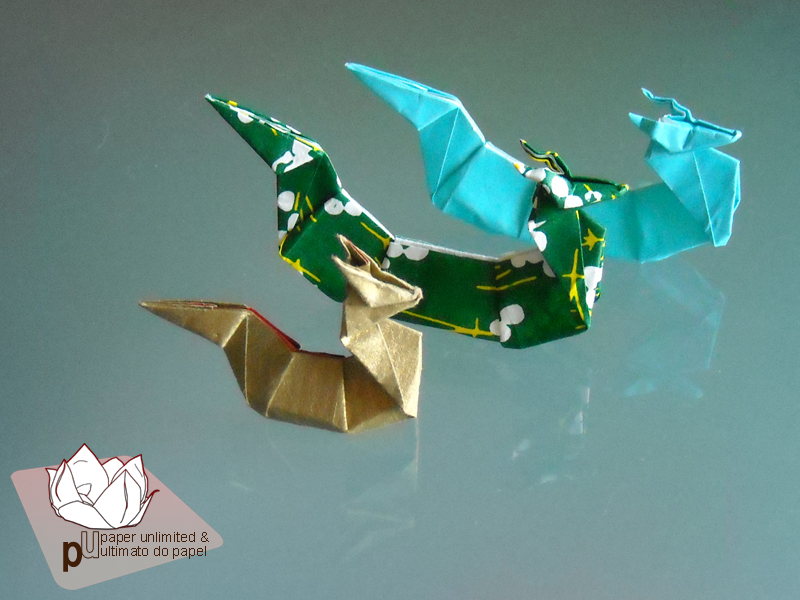 I believe it is more appropriate and specific since I want to fold more dragons and mythological creatures. 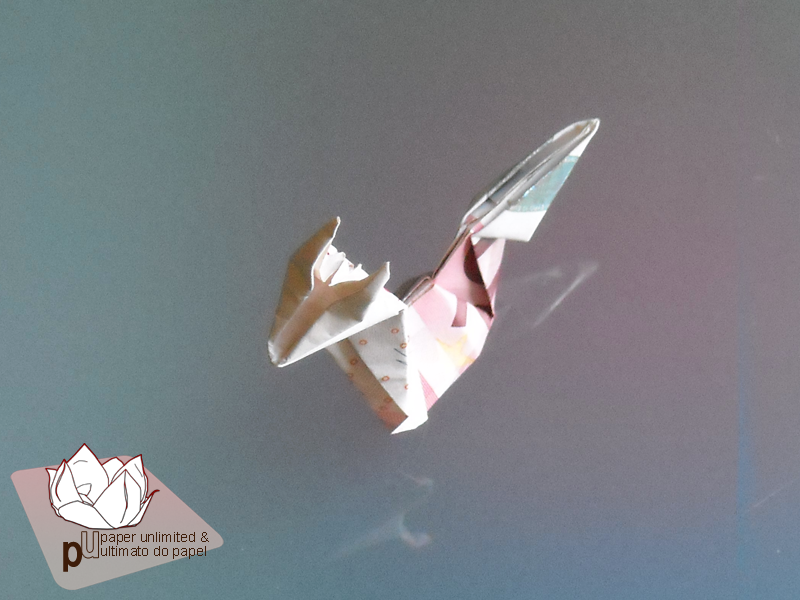 This entry was posted on 2012|02|18 at 17:55 and is filed under moneygami, origami. You can follow any responses to this entry through the RSS 2.0 feed. You can leave a response, or trackback from your own site.